If your dog is showing any of these signs, it’s important to seek treatment from your veterinarian as soon as possible. It’s necessary not only for your dog’s comfort, but also to keep the infection from spreading to the middle and inner ear. Most ear infections are caused by bacteria and yeast, although ear mites are another cause of infections, particularly in puppies. Allergies are also among the contributing factors in the development of ear infections. 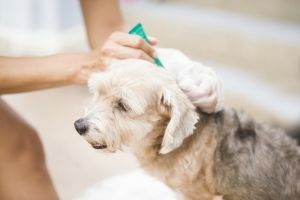 Since there are multiple causes and contributing factors that lead to ear infections in dogs, it’s important that an accurate diagnosis be obtained from your veterinarian. Ear infections are treated differently depending on the diagnosis. Most commonly, ear infections are treated with a professional cleaning and oral antibiotics or medicated ointment or drops. Your veterinarian will also likely prescribe something for pain. Be sure to follow your vet’s instructions to the letter. It’s imperative to complete the full course of medication, even if it appears the ear is significantly better. Lapses in treatment may lead to a recurrence. A recheck will be scheduled to make sure the medications are working and the infection is gone. It’s not uncommon for some dogs to have recurrent ear infections. To avoid recurrent ear infections, prevention is always the best medicine. Routine ear cleaning may help reduce the chances of repeat infection. Be warned, however, that too frequent and overly vigorous inner ear washes may be harmful to the ear canal. 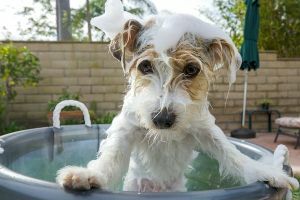 If moisture is a contributing factor, make sure that you thoroughly dry your dog’s ears after swimming or prevent water from getting in the ear canals during baths. Cotton balls can be very useful for this purpose. If food allergies are a problem, you may be asked to try a different brand of dog food for your pet. Your veterinarian can advise you on the proper care and procedures that are best for your dog. HELP! I THINK MY DOG HAS FLEAS! previous post: HELP! I THINK MY DOG HAS FLEAS! Conveniently located near Appleton North High School and right across from Ballard Plaza on the corner of Ballard and Edgewood (JJ). © 2019 Double J Dog Grooming. All Rights Reserved.